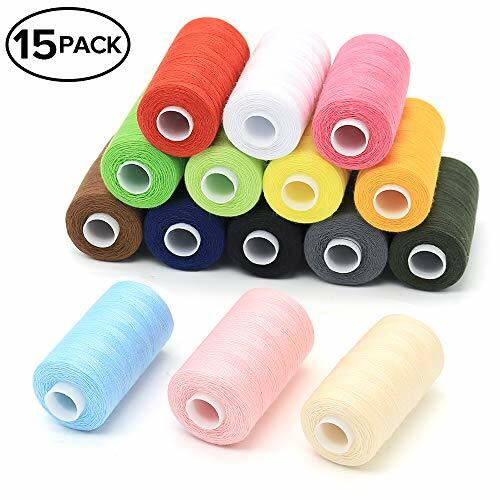 ★BEST VALUE: Come with 15 different colors thread spools, and each thread is about 16.7g. It\'s enough for your normal daily using. Brighten up all your sewing projects with this high-quality embroidery thread! The colors are from unadorned colors to vibrant colors, which are ideal for embellishing your crafts. ★HIGH QUALITY THREAD ASSORTMENT: The sewing thread made of durable polyester, and has superior strength and durability. It is colorfast, washable, and have no breakage. You can complete your projects faster, work more efficiently and without frustration. ★WIDELY USE: This sewing thread is suitable for small household sewing machines, and also depending on the size of the axis where put the thread. Usually it also fits standard sewing machine. What\'s more, whether you\'re professional or just began to learn using these. You\'ll find it\'s convenient for you to use these thread spools. ★MOM GIFT: As a ideal gift for mom, sewing beginner, children friends who need some basic necessities of sewing and love crafting. ★AWESOME AFTER-SALES SERVICE: Clan-X promises 100% satisfaction and 60 days quality guarantee. If you don\'t like your new sewing thread assortment, feel free to contact us. We are always willing to help you to solve the problem.